These sparkling, faceted gemstones are characterized by their needle-like inclusions which resemble black fibers on the inside. 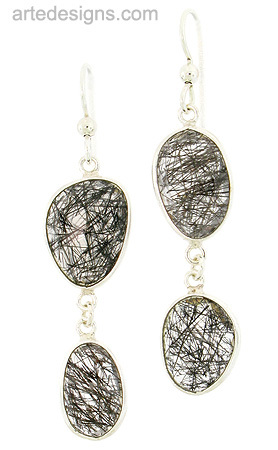 These gemstones are bezel set in sterling silver...unmatched, giving it a rich, abstract look. No two are alike. Sterling silver fishhook ear wires. Total length is approximately 2.25 inches long.